At a farmers market, a bounty of shiny tomatoes, bundles of green asparagus, and flats of fat black raspberries so full of juice they could explode can be bought straight from the truck of the farmer who grew them. But those radishes might not have been grown by the farmer smiling at you from across the table. In fact, the produce might not have been grown anywhere near Utah. As the popularity of farmers markets has grown, so, too, have efforts by growers to supplement their crops with produce bought on the wholesale market—the same place where chain grocery stores buy it. This eye on quick profits, some smaller farmers say, is cheapening their hard work, and also threatens to undo some of the more philosophical efforts being undertaken at farmers markets, which have been championed as the first line of defense against an industrial food chain that produces massive amounts of rock-bottom-priced food by relying on genetically modified plants, chemical pesticides and cheap immigrant labor. Kevin Nash, farmer and horticulturist at Earth First Eco-Farms, says that by meeting small farmers at the market, customers can learn about the actual cost of producing food. But any progress made on this front could be undermined if farmers of any size aren’t being honest about what they grow, how they grow it and whom they use to pick it. “It doesn’t help my cause, and it doesn’t really help to get people to start perceiving what food actually costs to produce,” Nash says. 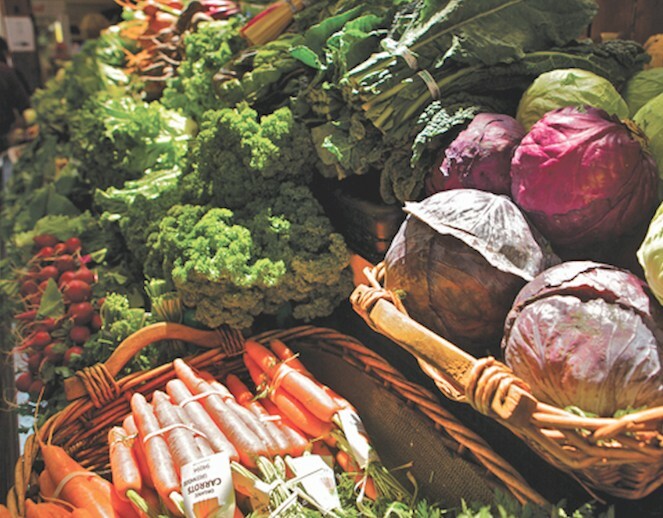 Nash’s produce costs up to $4 per pound, while a larger grower might charge a buck or two. That price difference, he says, is because he relies on organic growing techniques and loads of back-breaking labor. When Nash picks zucchini, he places the vegetables on a blanket and wraps each one in a different blanket to reduce bruising—a process that might sound ridiculous, he says, but isn’t if delivering the finest produce to the customer is the goal. Market managers’ attempts to combat out-of-state produce from being sold at local farmers markets range from conducting farm inspections to placing limitations on the distance produce can be grown from the market where it’s sold. But these policing efforts haven’t stopped the flow of wholesale-bought produce to farmers markets. Salt Lake City’s Downtown Farmers Market at Pioneer Park, which teems each Saturday morning with thousands of people, has become so large, with 85 produce vendors alone, that its organizer, the Downtown Alliance, can’t perform an inspection at every farm. Farms that participate in the downtown market, says Kim Angeli, the director of the downtown market, are inspected on a complaint basis. This means that Angeli relies on vendors to police each other, filing grievances when they suspect a farmer of hawking out-of-state produce. And if a vendor, or group of vendors, wants to post a $100 fee, Angeli will commission a third party to inspect a suspect farm. “In a perfect world, we would visit every farm before that vendor sold at the market, but we do not have the staff,” Angeli says, noting that she performs an average of two third-party inspections each year that spring from vendor complaints. Angeli says an especially bold attempt by a farmer to sell out-of-state produce came five years ago when a truck stuffed with California corn pulled up. Vendors quickly turned the farmer in, and the truck was sent away. But less blatant instances of wholesale produce being sold at the market abound, farmers say. One recent example came during the Downtown Alliance’s winter market at the Rio Grande depot. Chad’s Produce, owned by Chad Midgley, was told not to return to the market when a customer complained to market organizers that she’d purchased broccolini from Chad’s that was emblazoned with a produce sticker. Midgley says the broccolini that was sold at his booth ended up there by accident. During the winter, Midgley runs his own market at the Oasis Cafe and also provides a subscription-based produce package to customers. And when the produce is scant in Utah during the winter months, Midgley supplements his stock with greens from other states—a measure that his customers appreciate, but one that isn’t welcome at the farmers market. Midgley says he, too, is aware of other farmers who are either selling Utah produce that they didn’t grow, or produce grown in other states. He says he’s watched as farmers remove greens from store packaging to sell at the winter market. And he says he suspects that some cherry sellers are visiting orchards that offer pick-it-yourself deals for $1 a pound, only to end up at the market where they resell those cherries for much more, even though they don’t own an orchard. “I can go around and spot some commercial produce, but it’s a lot more rare than it used to be,” Midgley says, adding that selling wholesale-bought produce is a “temptation” for every farmer. Maryann Alston, founder of the Wasatch Front Farmers Market, which includes markets at Wheeler Farm, Thanksgiving Point and Gardner Village, says that when she started the markets four years ago, she immediately had problems with farmers selling wholesale produce. Alston says she had to take a stand against the practice early and make it clear to farmers that selling produce they did not grow would not be allowed. “It’s a big problem everywhere,” she says. To combat second-hand produce from popping up at her markets, Alston says, she inspects every single farm that has a booth. “We partner with farms that we absolutely know are growing their own produce,” she says. A farmer herself, Alston can relate to the slight her peers feel when other farmers aren’t growing all of their produce. But, Nash says, the markets are still a worthwhile place for farmers like him to keep fighting for sustainable agriculture and quality food.